Marlie has been really liking pajama pants lately, so I made some for her baby. 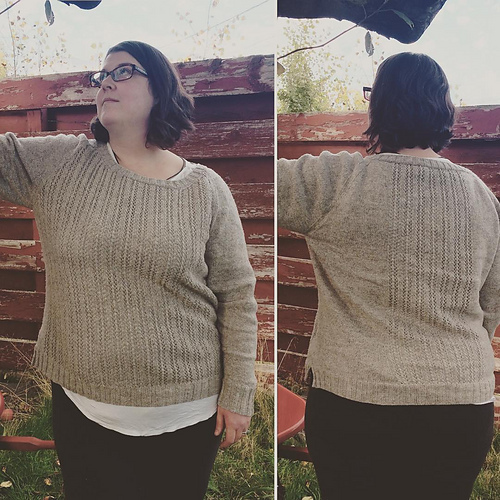 I basically followed pattern, but cut all the counts and measurements in half. The leg length was knit to fit, with a garter stitch edge. 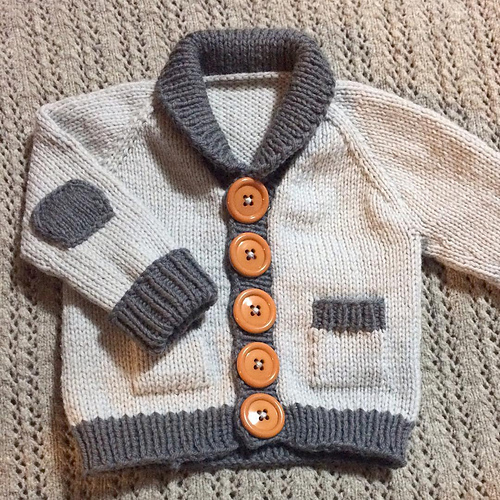 My brand new nephew needs a sweater for his first winter. CO 66. Work Ribbing for 3”. Work St. St. for two rounds. Work increase round every third round 21 times, then every fourth round 16 times. Work until sleeve measures 17.5” (I might have to go back and add an inch to this). Work Raglan. Work ribbing for 2.5”. Forego the two rounds of stockinette stitch. Next Row (WS): P63, pm, P57, pm, P63. Next Row (RS): Set pattern. Stockinette to stitch marker, 8 repeats of leaf lace pattern to next marker, stockinette stitch to end. Due to a few stitches that somehow got lost somewhere, I decreased every fourth row 18 times (instead of 19 times) on the front and back. Cast on 32 stitches (16 stitches on each needle using Judy’s magic cast on method). Increase to 80 stitches (40 stitches per needle). 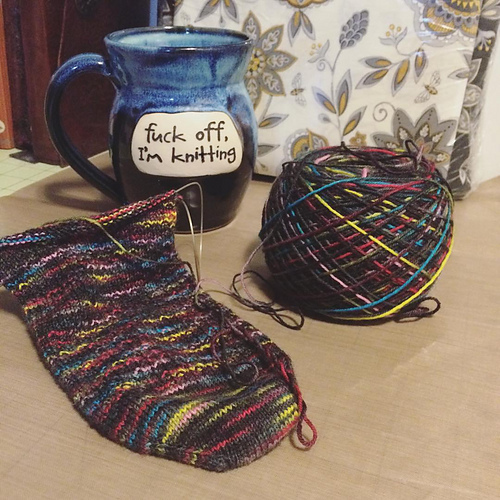 Start and use Gusset, heel turn, and heel flap from Steelhead pattern. Round 2: Needle 1: K2, Pm, K to 2 sts before end of needle, k2. Round 3: Needle 1: K to 1 stitch before marker, KRL, sm. K to marker, sm, KRL, k to end of needle. Move markers 1 stitch closer to outer edges on last round 4 before starting heel turn. Work until there are 10 w&t each side. Purl rows: Slip first stitch purlwise. As with many others, I made some modifications. 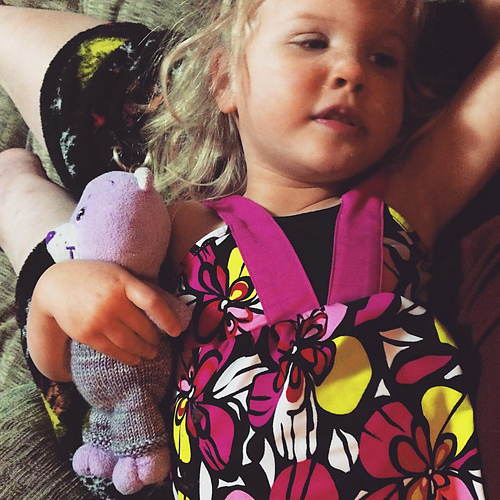 The perk of making our own garments is that we can tailor them to our own needs. I moved 6 stitches on each side of the back to the sleeves, and increased at the front every RS row 6 times. I also added the wider sleeve and yoke increases listed in the errata. Somehow my stitch count didn’t match up so I only increased by 10 sts at the underarm. I’ve accepted that boxy shapes don’t work on my body. My wide hips don’t tolerate it. I wanted to add about 4 – 6 inches for the hips. When joining the body after putting the sleeves on holders, I added stitch markers on each edge of the back piece and worked 8 inches on the body ending with row 2 of the stitch pattern. Next Row (pattern row 3): K to stitch marker, slip marker, P2, K2 to last two stitches before marker, P2. Slip marker, K to end. 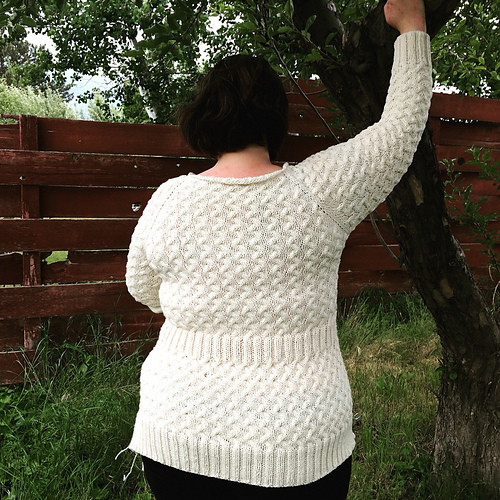 Work as established for two pattern repeats (or desired height of waist shaping) ending with pattern row 2. Next row (pattern row 3): Knit to stitch marker. Slip marker. kfb, k4 to last stitch before stitch marker, kfb. Slip marker, knit to end. (18 stitches increased). Continue in pattern until desired body length has been reached. Pick up 14 stitches, from the underarm placing beginning of round marker at the center of these stitches. Beginning with pattern row 7, knit as established for 3 inches. Work Decrease round every 4 rounds (cable rounds), 19 times. Work to 16 inches from underarm. Work 20 rounds of ribbing. I apparently use a modified Decrease Bind Off method. I love how it is a stretchy bind off that is loose enough for sleeves, collars and sock legs without flaring out as so many stretchy bind-offs do. P1, Slip left needle through the two stitches on the right needle to the front, P2tog. If working flat, repeat to end. If working in the round, repeat to last stitch. Work my favorite version of TECHKnitting’s binding off circular knits.